No sourdough here but at least they have "bread" in the name! I make lots of these every Christmas and they are very popular. This recipe also makes good building material for a gingerbread house. Make sure you leave the cookies to soften for a at least a week in a breathable container. They come out of the oven soft, then harden and after soaking up some air moisture go softer again. If you need them to soften quicker, place a couple of slices of apple in with them (change them daily so they don't spoil). Melt the butter in a bain-marie. Add the sugar, honey, spices and cocoa and gently heat for 5 minutes, stirring occasionally, until everything dissolves into a thick smooth paste. Leave to cool slightly. Sift the flour and bicarbonate of soda together. Mix it together with the eggs into the paste. Knead to make a smooth dough. Wrap in cling film and leave in the fridge overnight. Leave the dough at room temperature for an hour or until it becomes pliable again and knead again to ensure the cookies are smooth. Roll out on a floured surface to about 3 mm thickness and cut out shapes with cookie cutters. Place on a baking tray lined with baking paper and bake for 8 - 12 minutes at 150 - 160˚C (non-fan forced), or until the edges start to colour very slightly. It is a good idea to test bake just one cookie to see which oven setting and temperature work best for you. Leave to cool, then cover with a tea towel and leave overnight. Decorate the next day. Leave to dry out and then store in a breathable box in a cool room for a few days so the cookies can soften again. Mix the sugar gradually into the egg white and combine well with an electric whisk until the mixture becomes white and glossy. The icing has the right texture if it drops from the spoon in a thin stream which keeps its shape for a short while after landing on a surface. Spoon into a piping bag with a 1.5 or 2 mm nozzle (or a sandwich bag with a tiny bit cut off at corner) and decorate the cookies. You might have to adjust the thickness with more sugar or egg white - it always takes me a while before I get the right consistency which is easy to work with. Add food colourants for colours and cocoa for brown icing instead of lemon juice. 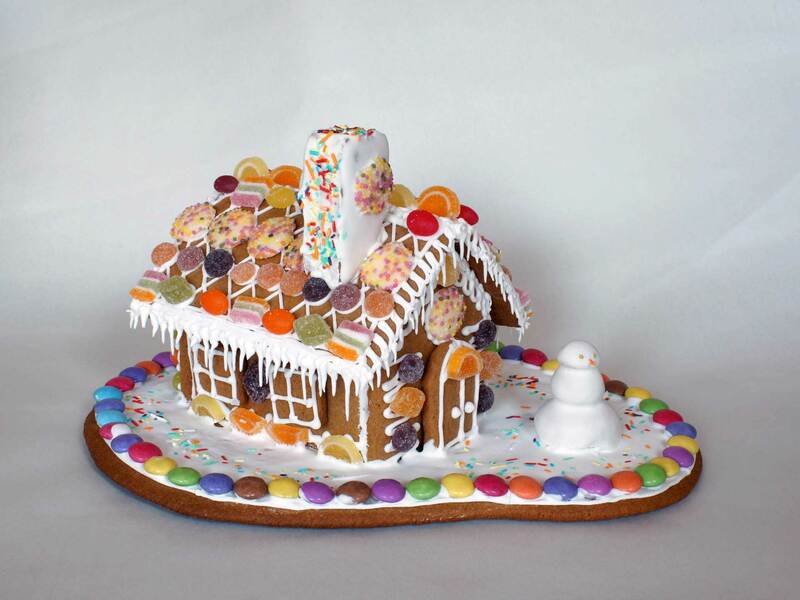 If you're building a house, use the same icing but a lot thicker to assemble it.